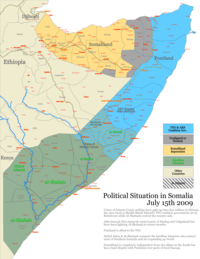 ^ "In Somalia, U.S. Escalates a Shadow War - The New York Times". Nytimes.com. 16 October 2016. Retrieved 22 October 2017. ^ David Brown (31 July 2017). "US airstrike kills Somalia fighter under new Trump authority". Washingtonexaminer.com. Retrieved 22 October 2017. ^ "BBC News - Somalia: 'Al-Shabab' militants forced out of Jowhar". Bbc.co.uk. 9 December 2012. Retrieved 19 April 2013. ^ "Fazul, le chef présumé d'al-Qaïda tué à Mogadiscio - Somalie/Comores - RFI". Rfi.fr. Retrieved 19 April 2013. ^ "Database - Uppsala Conflict Data Program". UCDP. Retrieved 19 April 2013. ^ "Somalia says US air strike killed civilians not al-Shabab". BBC News. 29 September 2016. Retrieved 2 October 2016. 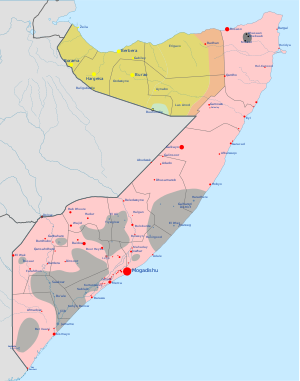 ^ "Somalia Historical Chronology". Security Council Report. Archived from the original on 11 October 2008. ^ "October 22, 2012 | Daily Monitoring Report. - AMISOM Daily Media Monitoring". Somaliamediamonitoring.org. Retrieved 19 April 2013.